The grant will help increase the number of high-need and Hispanic students earning bachelor's degrees by funding articulated pathways and academic support services. The Center for International and University Studies (CIUS) at Cañada College has received a major funding boost from the U.S. Department of Education’s Developing Hispanic-Serving Institutions Program that will make it easier for students at the college to earn bachelor’s degrees. The CIUS brings together two distinct programs at Cañada College: the University Center and International Student Programs. The University Center was established in 2001 as a new model to provide four-year college degree programs. Cañada is one of only a handful of community colleges in the state of California with a University Center which came into being through special state legislation sponsored by Lou Papan with the support of the San Mateo County Community College District. It is designed to extend higher learning to peninsula residents that cannot travel to participating universities. The University Center offers bachelor’s degrees and professional certificates in an array of academic subjects including business administration, child and adolescent development, psychology, allied health, human services, and nursing. All courses are taught by faculty from partner universities including San Francisco State, Notre Dame de Namur, and National University. The A2B (associate’s degree to bachelor’s degree) Program grant will fund a specialist assigned as a case manager to each Cañada student who completes 30 units towards the associate's degree and has expressed interest in ultimately completing the bachelor's degree. The A2B specialist works with academic advisors, the transfer counselor, and Learning Center staff to ensure that students have the information, education plan, and academic support they need to complete their associate's degree and move smoothly into and through a University Center bachelor's degree program. The A2B specialist will also partner with the college's and partner universities' financial aid staff to create with the student a financial aid plan that clarifies how the student will pay for the higher tuition rates the universities charge. A part-time librarian to provide specialized library services in the evenings and weekends to students preparing for transfer to a bachelor's degree and to students who are completing a bachelor's degree through a University Center program. 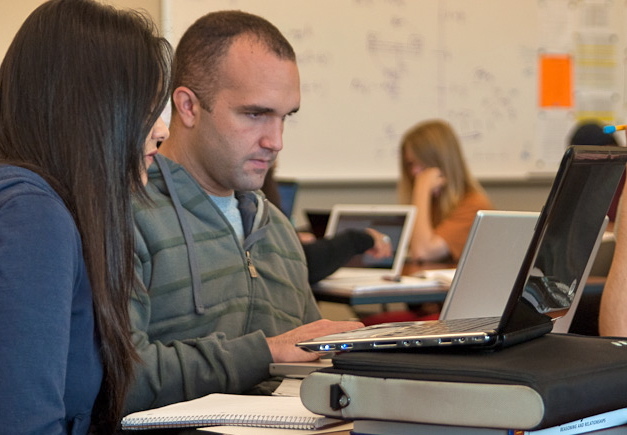 A distance education designer to design hybrid courses that combine classroom and online time, as well as online courses, so that University Center students can still work towards their bachelor's degree even when they are unable to attend classes on campus. Learning Center tutors to assist students in developing skills to succeed in upper-division coursework. A researcher to refine data collection strategies and to track student success after transfer to University Center programs. “These positions are crucial to support the success of our students as they transition from community college to university academics,” said Lucy Carter, director for the CIUS. With grant funds, Cañada will also develop a peer mentor program for University Center students and improve University Center infrastructure including the internal website for partner university faculty, the billing system for facilities-use fees, University Center outreach strategies for new programs, and cross-institution calendar coordination. Carter will oversee the A2B program, with a project director managing the day-to-day activities. The grant also funds three University Center partner universities to provide advisors to work with the A2B specialist and with students to ensure the smooth transition from associate's degree to bachelor's degree and to articulate clear pathways from Cañada’s degree programs to the bachelor's degree programs offered on our campus. The three partner universities are: San Francisco State University, which will offer a new Bachelor of Arts in Digital Animation; National Hispanic University, which will offer a new Bachelor of Arts in Child Development; and Notre Dame de Namur University, which will expand its Bachelor of Science degrees in Business Administration and Human Services. The college will receive $624,255 in the first year of the grant and between $646,000 and $714,000 for each of the final four years.